The leader of the United Democratic Party, UDP who doubles as the Minister of foreign affairs have dismissed claims that president Adama Barrow will serve for three years instead of five and threatens to take the matter to court. 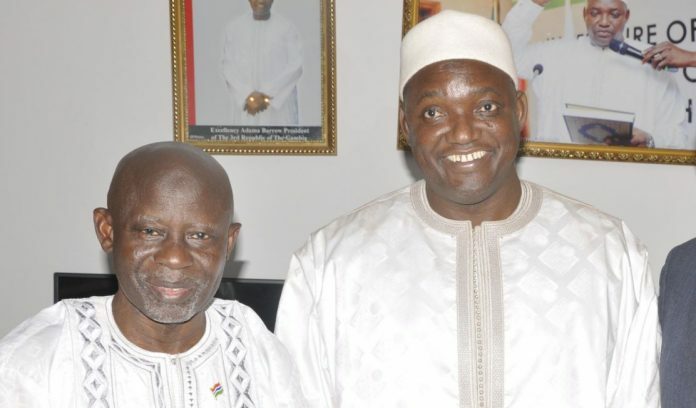 Mr Darboe was addressing the members of the press at the party’s headquarters when three parties came together to form a tactical alliance ahead of the April 6th National Assembly elections. When asked about the agreement reach by the coalition in October for the president to serve for three years after which fresh elections will be held. Mr. Darboe replied with confidence that those who are advocating for president Barrow to serve for three years are power hungry.’The Constitution says that he most serve for five years and you want to tell me he should serve for three years so that he can clear the way for you to become the president, they are all power hungry people’ Says Darboe. He went ahead to say that the a president’s mandate is five years and anything less than that or more than that is against the Constitution and anyone in his right mind who knows how the Constitution of the Gambia works will not advocate for Barrow to step down after three years. That statement is a non starter and I will be the one to challenge that in the courts because the unconstitutionality of such an arrangements cannot be accepted. It could be recalled that the eight political parties that came together to form the coalition last year to uproot dictator yahya Jammeh in an MOU signed agreed that if they achieve their objectives, the president will served for three years after which all political parties will go back and prepare for fresh elections.